Perhaps the most popular slides in the late nineteenth century were those termed ‘life model slides’. By this we mean the photographic slides on which costumed actors are posed in scenes or on locations to illustrate songs, moral tales, sentimental stories, narratives or other texts. Like the film the models are placed against an actual scene or a painted set. Various stage props would be placed around the actors to complete the scene. 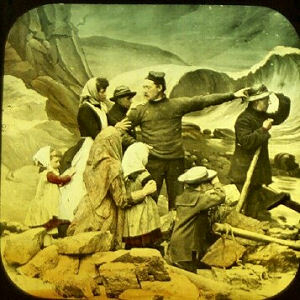 In particular, organisations like the temperance movement, the Band of Hope and the Salvation Army used the slides extensively to convert a mass audience. The slides were also used in religious services as an illustration for a narrative interlarded with hymns. Often the words of the song would be flashed on the screen so that the audience could join in, accompanied by the harmonium or the piano. The slides were often sold in boxes, along with a booklet from which the story or verse was read aloud. Sets could comprise as many as sixty or as few as two. Though the slides were very popular, only a few manufacturers produced them. We don’t know more than a dozen producers, among them the well known British companies of Bamforth & Co and York & Son. Probably Bamforth was the first one who employed life models for slides. His first life model slides were often imposed on the background photograph of an actual scene and show sometimes curious errors in perspective. His models were often members of his family and other local people who posed for the photographer for little or no pay. Most of the other producers did not advertise their names on the title slide of the sequences as Bamforth often did and remained unknown. The only other country with a significant life models production was the United States. 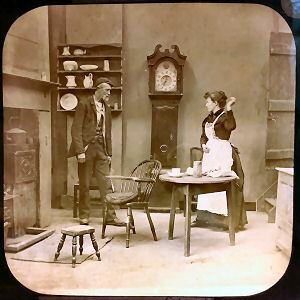 The same stage properties were often used in various sets, like the large clock in these two sets. pictures: One slide from the series 'Joe Sparks", and one from the series "Poison in the Packet", both made by Bamforth & Co. Some of the elements of the life model slides can be found in earlier media such as book illustration, narrative engraving sequences and commercial photography, but they also employ many of the devices which we know from later cinema, particularly the flash-back and the convincing presentation of the fantastic. In some series we already find the close-up, an effect successfully used in later movies. This kind of slide is mainly produced between the 1870s and the First World War. 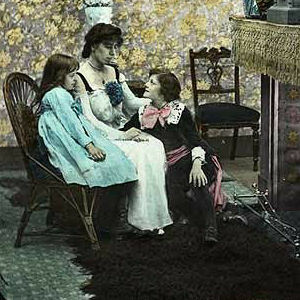 The heyday of the genre was in the 1880s and 1890s. Later on it declined in popularity and was used mainly in short sets to illustrate popular songs. picture: one of a set of 40 (!) live model slides 'The Musical Miller', made by W.M.S.S.D. (3, Ludgate, Circus Bldgs, E.C.) London, England. 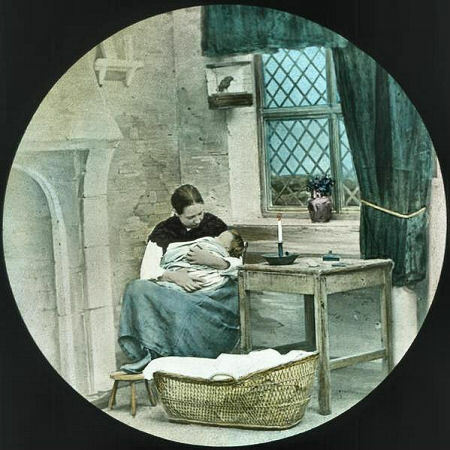 A well-known set of magic lantern slides showing life models is the story of	'Jane Conquest', based on a narrative poem written by Mr. James Milne of Newcastle, originally published in The Methodist Family. This set of 16 slides was probably made by Bamforth of Holmfirth, Yorkshire, UK and is dating from around 1890s. The slides are regular 3,25" square. According to the texts of his advertisements, by the late 1890s James Bamforth was ‘The Largest Producer in the World’ of life model slides. We are not sure of this claim, for the firm was accustomed to use a bombastic style, but at least he must have been one of the largest. Bamforth started as a studio photographer in Holmfirth, in 1870. 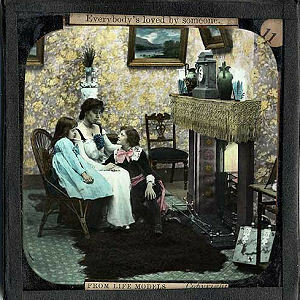 Some ten years later he began making lanternslides in a variety of subjects, but soon he specialised in Life Model sets. Though the quality of Bamforth’s early life model slides leave much to be desired, with their unrealistic backgrounds, faults in using perspective and other technical shortcomings, he soon achieved the artistic style that makes a Bamforth slide immediately recognisable. Around 1898 a large extension of the studio in Holmfirth was built and branches or agencies in London and New York were opened. 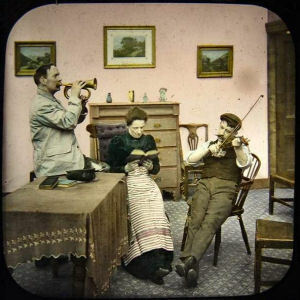 After producing a few comic films, mainly based on slide sets, the company began to produce photographic postcards, initially from the same negatives as the slides. Soon the success of this venture began to surpass the production of slides, that appears to have finally ended during World War I. Life Model slide made by Bamforth. "Valley where the Blue Bird sings". 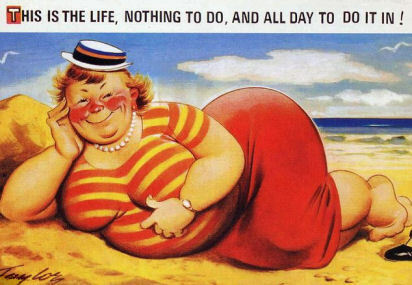 Today the company is remembered mainly for their later specialisation in saucy seaside postcards depicting fat ladies, dumb blondes, mothers-in-law and henpecked husbands. The family business was taken over by Dennis & Co. of Scarborough in the early 1990s. Pages from a York & Son catalogue. 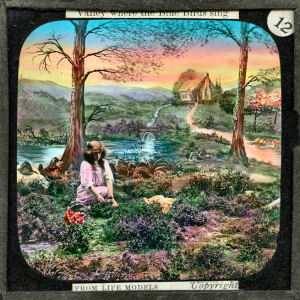 The English lantern slide maker and supplier Frederick York moved with his wife to South Africa on account of ill-health in 1853. The family got two sons and stayed there until 1861, establishing three photographic businesses. 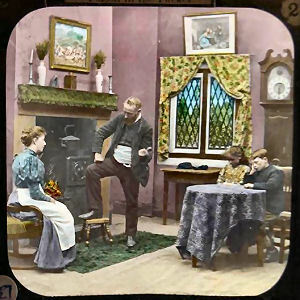 Back in England, York started a business in London, in 1863, and soon built up an international reputation for the high quality of his magic lantern slides, being his favourite side of the business. His son William joined him in 1877. By the 1890s the production of York & Son exceeded 100,000 slides per year and by 1900 even more than 140,000. Slides from 1890 are identifiable by their trade mark, a ‘Y’ with a snake entwined, set in a triangle. 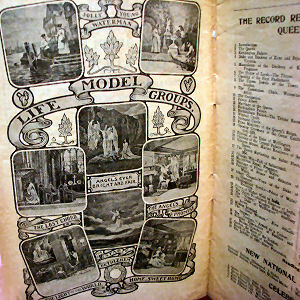 Their catalogues covered every subject, like Travel, Comic, Science, Education and...... Life Model series, which were produced with particular dedication. Their resident scenic painter and stage manager E. T. Green provided the very elaborate backdrops. After Frederick’s death in 1903, his son carried on as a manager, but due to the waning popularity of the magic lantern the business formally dissolved in 1907. Later on the company was taken over by Newton & Co. The new owner closed the existing premises and opened York House in South Kensington. New slides were produced, but also the complete back catalogue of York & Sons was still available. Production continued until the late 1940s. Have a look here to see a lot of magic lantern sets using life models.